JOIN US ON A VERY SPECIAL “WALK THROUGH TIME”! 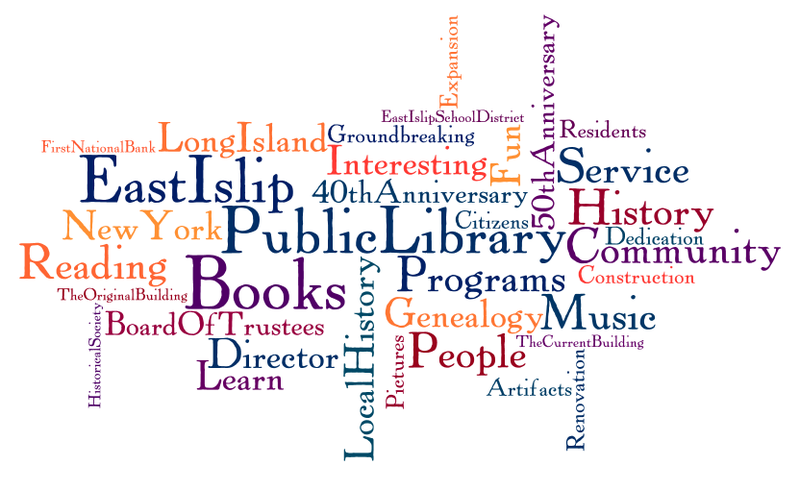 This website chronicles the rich history and evolution of the East Islip Public Library, from the beginning, to the present day, and looking forward into the future. We sincerely hope that you enjoy all there is to learn and explore! The first East Islip Public Library to serve the East Islip School District began June 21, 1961. It was located in a building that once was The First National Bank of East Islip. At that time, the library only served a few thousand people and the size was big enough to provide services without any need for expansion. Over the course of several years, the amount of people within the community grew and the library needed a brand new building. The construction of the first actual building specifically designed for the purpose of a library was done in 1967. In 2001, that building was renovated and two-stories of addition space were added, creating the East Islip Public Library that stands today.